The Whirlwind MK4 Series Accusonic+2 Microphone Cable [25' (7.62 m)] is built with Accusonic+2 cable and fitted with Whirlwind XLR connectors for consistent peformance under the harshest conditions. 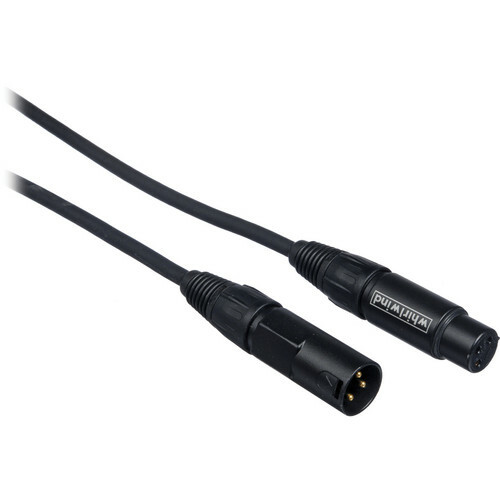 Box Dimensions (LxWxH) 8.5 x 8.0 x 1.4"
Accusonic+2 XLR Male to XLR Female Microphone Cable [25' (7.62 m)] is rated 5.0 out of 5 by 5. Rated 5 out of 5 by Zach from Solid Cable I'm using these to connect an interface to a small diaphragm pencil condenser and a large diaphragm condenser and they work flawlessly. Only thing would be the difficulty in plugging them into the mics themselves, but that was easily fixed by tightening the ends a bit. They feel really solid and the 25' is a really good length. No complaints really, great cables, great company. Rated 5 out of 5 by Anonymous from Long Lasting We set up and tear down our sound equipment every week, and these cords have lasted us over 5 years! Rated 5 out of 5 by Michael_j from Excellent Cables Great cables, super strong, good connectors, and can't beat the price. Rated 5 out of 5 by Mark, TV Cameraman from Nice Cable Very durable and solid. I expect it to last a long time. Rated 5 out of 5 by GD from Work horse Whirlwind cables are always great. Durable.